Vast banana plantations cloak much of Tazacorte, which is why the borough is synonymous to this crop. In fact, they even have a banana museum, the only one of its kind in Europe. 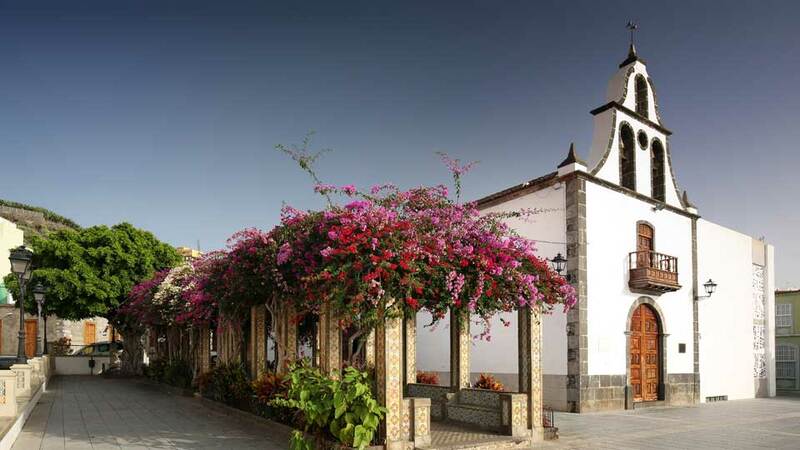 Be that as it may, there is more than meets the eye even if it is the smallest municipality in La Palma. At only 12 km², Tazacorte boast of a picturesque shoreline and two historical villages. This erstwhile unexplored treasure, blessed with the finest weather on the islands, did not remain hidden for long, though. The subjugation of La Palma started on the shores of what is now Tazacorte towards the end of the 15th Century. Natives met the arrival of the Castilians with fury, and soon, bloody battles ensued. It was in one of those bloodbaths that Tazo, the Guanches king, met his untimely death. Since then, the site of the fallen king was called Corte del Rey Tazo (the cutting down of King Tazo). Later, it became Tazacorte. Following the successful conquest, the conquistadors established a feudal structure on the island. Soon enough, Tazacorte’s local economy flourished because of its perfect location. The beautiful cerulean waters had an abundant aquatic life. Likewise, the fertile land was also ideal for crop and plant growth. From Sugarcane fields, it evolved to banana plantations. To this day, it remains the primary source of livelihood. In most of the Canaries, villages have whitewashed or monochrome houses. In contrast, the sight of colorful houses in Tazacorte with traditional Canarian architecture is a visual treat. Its natural black volcanic sand accentuates the expansive blue sea. And the quaint little village set amidst banana plantations, while idyllic, is charming. This seaside wonder is ideal for visitors who prefer a laid-back beach vacation. In contrast to the many party beaches in the Canary Islands, Playa de Tazacorte is serene and natural. No artificial sands, fountains, or coves to entice more tourists. The village is set on a ravine between the western tip of Caldera de Taburiente (Punta Candelaria) and a towering plateau. With an onyx sand beach, azure sea, and nearby geologic formations, there are more than enough for tourists to keep coming. This exceptional playa is the most visited for a few reasons. Because most other beaches have pebbly sands, its powdery volcanic black sand stands out as a favorite among the locals and tourists. 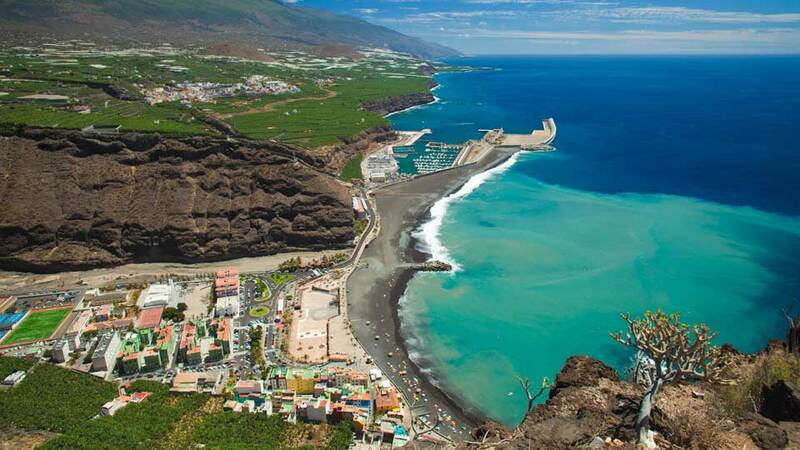 It is also the longest beach in La Palma, as well as the only official nudist beach in the island. Not only is it a bit secluded but it also offers a magnificent view of the Atlantic Ocean and the harbor. Playa de Tazacorte has a very relaxing atmosphere from the village to its shore. It rarely gets crowded and, when it does, it’s unlike the other tourist resorts. Protected by the breakwater that shields it from the rough Atlantic sea, it is also safe. A popular activity for tourists is to lie on the soft dark sand and catch up with their favorite authors. There’s also more than enough space for families to make the biggest sand castles ever. Kids can play and have fun on the tame waters anytime. Finally, as the day ends, the sky gives way to a spectacular sunset. Although lounging by the beach is great, the dazzling sea can be very inviting. In Tazacorte, there is an array of options for everyone. Beneath the sea, the underwater world beckons. The diverse aquatic life calls out to snorkelers and scuba divers to explore its otherworldy realm. On the surface, fun and adventure awaits those who go kayaking, ride the cute Volkswagen Beetle pedalos or banana boas. As an option, operators can organize fishing expeditions or dolphin and whale watching trips. Guests can also go cruising on a boat with submarine vision. Sauntering on the promenade is a must-do in Tazacorte as it offers some of the most incredible views on the island. Vibrant colors juxtaposed with man-made structures enhance the charms of the natural surroundings. Experience nature in its pristine state with huge volcanic rocks and ebony beach. Lining the dull concrete harbor are boats of many hues seeming like a bouquet of beautiful flowers. Wherever one sets eyes on, there is something to feast on in Playa y Puerto de Tazacorte. 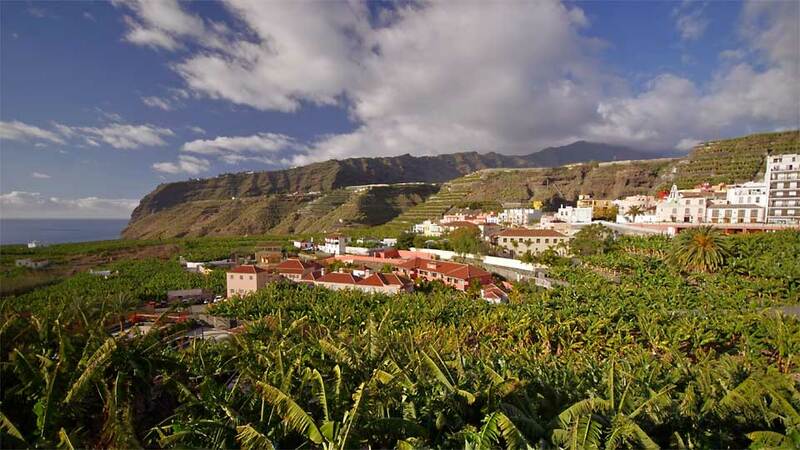 Going inland towards El Pueblo de Tazacorte is 1.5 km of seemingly endless banana plantations. Like a secret unfolding, the winding road opens to a quaint little village no one thought would be there. Much of the town’s history is centered in this part of the land, and so is its current population. It doesn’t make the village less appealing though as the old is in a perfect orchestra with the new. La Palma owes its first church to the same man who conquered it, Alonso Fernández de Lugo. As the most powerful man on the island and an ardent follower of St. Michael the Archangel, he spared no effort in proclaiming his faith. At the end of the 15th Century, the saint became the island’s patron, and its first church was also named after him. Although the church has undergone restorations and expansion, it still shows the grace and beauty of its old age. Travelers will not be disappointed as the original design was kept and followed. Furthermore, the old painting of Saint Michael Archangel spearing the devil in the mouth is still in there. Built in the 17th Century, the enormous mansion of Nicolás Massieu Van Dalle and his wife Ángela de Monteverde y Ponte remains to be a symbol of exquisite taste and opulence. Intricately carved from wood, the large main door is the first thing that greets guests into the property. On the side entrance towards the next building, the lintel boasts the family coat of arms in pure marble. The magnificent house is now owned by the governing body of the island, the Insular Cabildo of La Palma. It is also under the management of the town’s local government. Although no longer the host of extravagant banquets amongst the affluent, it’s now the venue of many activities that exhibit the culture of Tazacorte. Banana plantations occupy much of Tazacorte. As such, almost half of its residents work in these plantations. Because of that, they opened the only-one-of-its-kind banana museum in Europe. To get there, guests will have to drive through what seems to be a never-ending road amidst banana fields. In this facility, visitors learn everything there is to know about it and its rich history. At the end of the tour, they are sure to understand why the fruit is a serious deal in this part of the island. Furthermore, a “mojo” (Canarian sauce) museum is soon to open beside it. Tourists who love Canarian dishes shouldn’t miss it. To maximize the visit, guests should visit the tourist information center. Here, the local staff can give information on the sights and things to do in Tazacorte. Winter opening hours: Mondays to Fridays, 9:30 – 13; Saturdays, 15:30 – 19:30. The public transport system of La Palma is reliable, and it is also the cheapest way to go around the island. From Los Llanos de Aridane, Transporte La Palma bus line 207 goes to Tazacorte every day. For regular working days, it leaves at exactly 08:45, 09:45, 11:45, 13:45, 16:45, 18:45 and 20:45. On weekends and holidays, it leaves at 08:45, 10:45, 12:45, 14:45, 16:45 and 20:45. Coming from Santa Cruz de la Palma, there’s no direct bus to Tazacorte. As an option, tourists may take Transporte La Palma bus line 300 to Los Llanos de Aridane and then take bus line 207. It departs at 08:30, 11:30, 14:30 and 15:30 on regular working days, and 08:00, 11:00, 14:00, 16:00 and 19:00 during weekends and holidays. Tourists may also hire a car, and there’s plenty of car hire companies in the bustling towns. Some hotels and resorts also have their car hire service. If coming from the capital, take Take LP-3 to Camino Los Palomares then left to LP-2. For those coming from Los Llanos de Aridane, take LP-2. It’s only a 10-minute drive away. Travelers are bound to be fond of their stay in Tazacorte. As most accommodations are near a beach or on top of a hill, finding one with stunning views won’t be hard at all. Most apartments have swimming pools and a fully-functioning kitchen. But for tourists who prefer hotels, they have but one choice within the town. No worries though, because it’s a masterpiece of a hotel. And, no matter where they decide to stay, the town itself is sure to wow. Without a doubt, Hotel Hacienda De Abajo is the best and most beautiful hotel in Tazacorte. This adults-only (over 16 years old) hotel is only a 12-minute walk away from the beach. Not only is its location convenient, but guests also rave about its magnificent and individually decorated grandiose rooms. 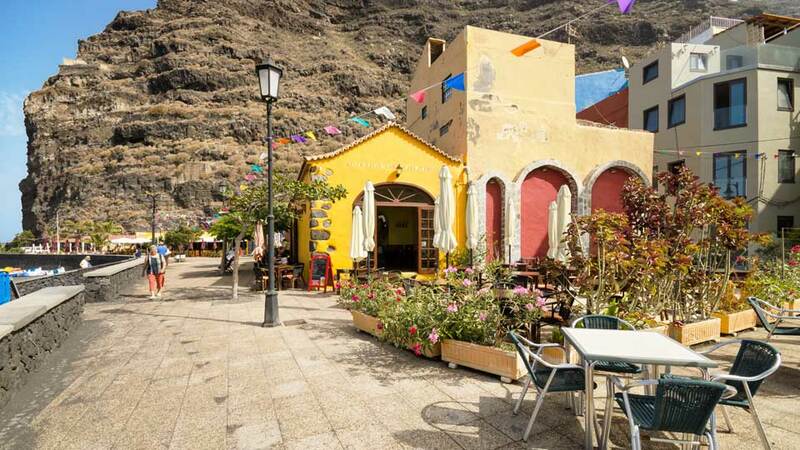 They also have a restaurant that serves Canarian cuisine with international influences, free spa, heated outdoor pool and a garden filled with exotic plants. To experience living like royalty, this is the place. Casa Bella is an adults-only apartment complex that is only a 10-minute drive from the beach. They offer spacious one-bedroom and double bedroom apartments. Although not located on the beach or somewhere near it, the property has a beautiful outdoor swimming pool for guests to enjoy. Moreover, it is popular amongst couples who are absolutely in love with the ocean or mountain views from the private balconies. The family-friendly Apartamentos Finca La Cruz is a large property. Thus, it’s perfect for families with kids because there’s ample space for them to play in. It’s also recommended for a large group of friends as they have 1, 2 and 5-bedroom apartments which can be combined if they want to. Also, since the apartment complex sits on top of a hill, it has fantastic views of the sea and the mountain. It’s also just a 5-minute drive from the beach. For travelers who believe that “home is where your pet is”, Casa Jorsam comes highly recommended. It’s a two-bedroom house with two single beds each so that it can accommodate a group of up to four people. While it is only a 9-minute walk away from the beach, it also has a swimming pool. This country home is a cozy place for guests and their furry friends. When it comes to food, more is expected from a seaside resort than anywhere else. First of all, seafood cannot be less than perfect. As the primary (or at least one of) produce of a coastal town, anything less than excellent is an embarrassment. Second, the restaurant itself must be stunning. Being in a paradise means the restaurant must be at par. If it’s not, then why is there? Third, tourists are from everywhere. Thus, there should be an array of different cuisines, and restaurant workers should be able to converse in more than just their mother tongue. Fourth, everything should taste better. Because prices are usually higher in tourist spots, people have higher expectations too. The Restaurante Las Norias is one of the most popular restaurants in Tazacorte, and it’s fantastic. In fact, many tourists and locals drive to dine there despite plenty of other options. Their must-try include any of their BBQ meats, mixed plate, steak, brochettes, crayfish ravioli, garlic prawns, sirloin in mushroom sauce, banana soup, rosemary potatoes, and pimientos de Padron paired with gin and tonics or wine. Restaurante Las Norias is the place for unforgettable Mediterranean and European dishes. The best seafood restaurant in Playa y Puerto de Tazacorte is without a doubt Playa Mont Restaurant. They serve light but flavorful seafood in Mediterranean, Spanish, and European style. Their most popular dishes are garlic prawns, fresh fish, fried squid, fish with Canarian potatoes and mojo verde, papas arrugadas with mojo, and alfonsiño. If there were pageants for restaurant dishes in Tazacorte, Restaurante El Sitio would win the top prize every time. Their whole menu is beautiful and sumptuous, but the most popular ones are the salmon tartare, red tuna tartare, steak tartare, suckling pig, banana soup, octopus with spices, guacamole with banana chips, and duck foie. The local wines they served are also amazing but run out fast because of the high demand. If it’s available, it’s a must-try. For a superb dining experience for both the eyes and the mouth, Restaurante El Sitio is the best choice. The name best describes what tourists must do when they spot this restaurant – seize the day and the opportunity to dine in it. Try their lobster bisque, fresh anchovies, tuna, lamb ragu, steak, sea bass, stuffed chicken, sea bream, gazpacho, or Thai chicken for mains. If feeling a little bit more adventurous, guests can also go for rabbit lasagne or chicken livers. For dessert, their coffee pudding and creme brulee will certainly please anyone’s sweet palate. This restaurant is always fully booked, so make a reservation to truly seize the day. Most tourists come here looking forward to having fun, but they always end up with more. Often leaving with luggage full of unforgettable experiences and happy memories, they remember passing by thousands upon thousands of banana trees before the seeing the charming little pueblo. It’s reminiscent of Alice falling down a rabbit hole into to a dreamlike wonderland. Likewise, it was strange, and then it was beautiful. They remember the serene and vibrant colors of the coastal village, and most importantly, they remember to come back to Tazacorte.